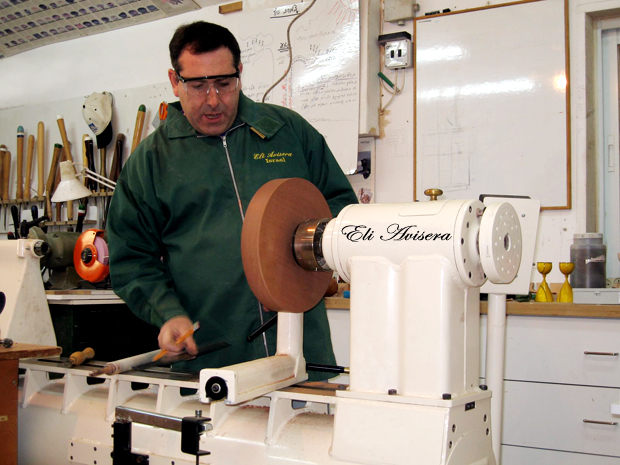 Eli Avisera is a gentle, kind, soft spoken extremely creative and talented woodturner. Eli was born in 1960. He grew up, studied and lives in Jerusalem. Between the years 1973-1977 he studied at the school of wood art in Jerusalem. Since then, Eli became a professional woodworker. Eli is an international woodturning demonstrator and teacher. He was invited to many countries to show his unique variety of techniques. In 1988 Eli established the “Wood Craft Center” where he teaches workshops for furniture building, wood turning and wood carving at all skill levels. To date, Eli has taught hundreds of students and has been instrumental in promoting this art in his country. In 2003 Eli has been invited to Woodturning Center, Philadelphia, , as an ITE participant. ITE – International Turning Exchange is a prestigious International event, bringing together every year a small group of carefully selected Wood Masters to share their knowledge and create together. You can learn a lot about woodturning and woodworking through Eli’s latest instructional videos. They include sharpening instructions, special projects and general technique instructions based on Eli’s extensive knowledge and experience – these DVD’s are highly recommended if you want to see how a master works!